One of the most well-know chord progressions in popular music of the 19th century and later. Countless jazz and popular songs have been composed within the structure of this series or progression of chords. 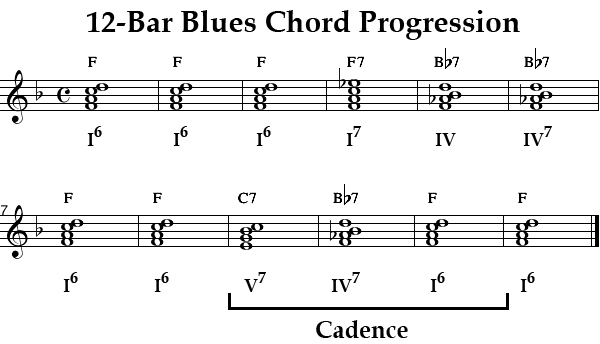 The basic blues progression uses 3 chords - the Tonic (I ) or the chord that the song is centered on, the Dominant (V ) or the chord based on the fifth step of the Tonic scale, and the Subdominant (IV) or the chord based on the fourth step of the Tonic scale In the example below, we use the key of F major. Thus the Tonic is F the Dominant is C and the Subdominant is B-flat . There is a cadence starting in measure 9 going from the Dominant V to the Subdominant IV finally to the Tonic (I) in measure 11. There are many variations on this cadence and may be V-IV-I or V-I or II-V-I, etc. 1. The progression is 12 measures long. 2. The 5th measure is typically the Subdominant (IV chord), or the chord based on the fourth step of the Tonic scale.